I'm constantly working to improve my digital editing skills. Doing so can produce a remarkable improvement in how photos looks. Take this photo below for example. When I saw the photo of a cowboy roping cattle right from the camera I loved the subject matter and the composition and action, but I hated the lighting and I thought the colors looked fake. I have a rule about digital editing...I liken Photoshop to makeup on a woman. If you can tell a woman is wearing makeup, she's probably wearing too much. Same goes for Photoshop. If you can tell a photo has been edited and manipulated in the digital darkroom, you probably went too far. A few years back when I first took this photo I edited it a couple of different ways. I was never really pleased with how it looked. After a few more years of studying digital darkroom techniques, however, I decided to revisit this photograph again. And below you can see the results. The photo on the right is how I first edited the photo a few years ago. The photo on the left is my most recent edit Move the slider and you will see the difference between the two. Some might light the color technique applied to the photo on the right, but I don't. I like it better how it turned out now. It seems more real to me, and that's what I wanted. 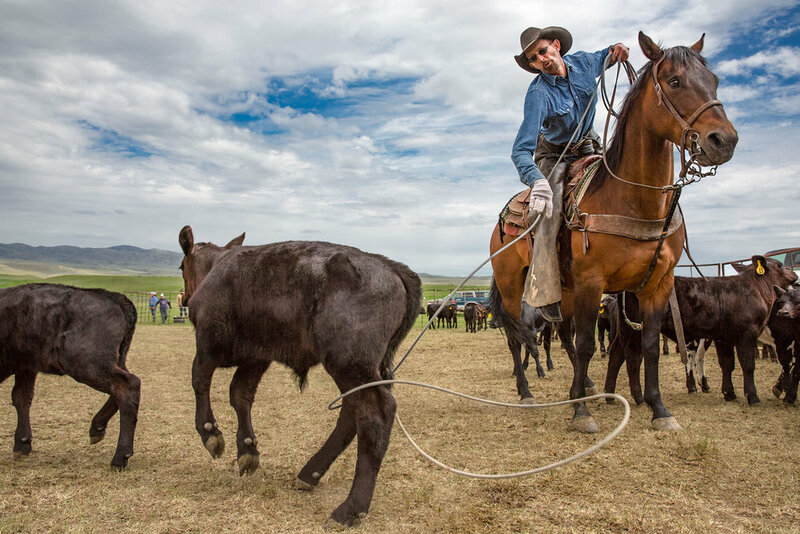 A close-up of a cowboy roping a black Angus calf on a ranch near Cleveland, Montana.